At a certain point, inspiration turns into desperation, and I think Mr. Darkwing passed it a long, long ways back. 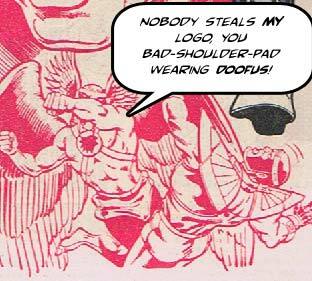 It's not just the pathetic flat Thor-wannabe helmet wings, or the doughy ill-fitting Superman underwear knocoffs, it's the fact that even though his foe is Hawkman, he stole Hawkman's logo! Granted, he reversed it left-to-right, but come on, pal, it's like you're not even trying. If I were Hawman, I'd hit him again. 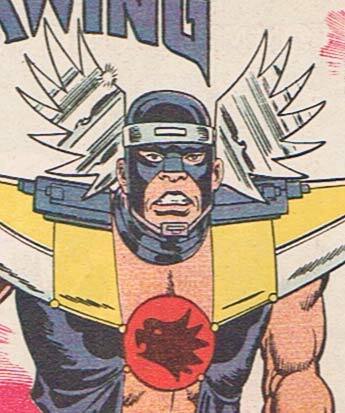 Because as bad as a Thanagarian thief is, a Thanagarian fashion thief is even worse. Wait, wings? Those things put me in mind of metal moose antlers. That’s funny, because a reversed Batman logo would just be the Bat logo… It would have to be upside down to be any different, but I definitely wouldn’t wanna be the baddie who did such a thing to Batman’s emblem. 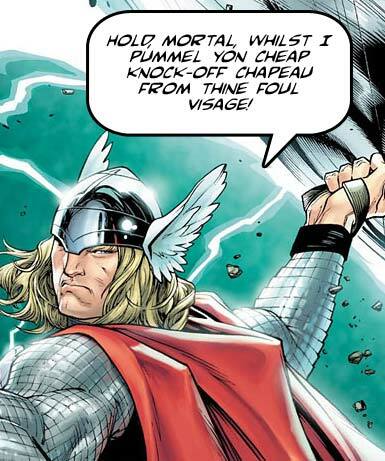 Another point of note: Hawkman’s winged helm predates even Thor’s by years.